Creating provocative album titles that give insight into his current musical state of mind, Nick Colionne has done it all in his multi-faceted career. He’s mastered the art of Keepin’ It Cool (2006), transcended musical boundaries to explore realms where there are No Limits (2008), fired up his thousands of worldwide fans with Feel the Heat (2011) and dug deep into his musical soul to share some of his deepest jazz and R&B Influences (2014). While keeping up his whirlwind pace of 75-plus shows per year as one of the genre’s most tireless and explosive live performers, he made history with his 2016 collection The Journey – becoming the only artist in the history of the format to score five consecutive #1 singles on the Billboard Smooth Jazz National Airplay and Smooth Jazz Songs charts from a single album. What is the secret to Nick’s extraordinary impact? The title of his 2018 Trippin’ ‘N’ Rhythm album says it all! Keeping his incendiary, yet heartfelt mix of jazz, R&B, funk blues and soulful, seductive vocals fresh, funky and innovative every time out, Nick works his magic by… Just Being Me. Nick’s ability to electrify by Just Being Me has made him one of the most in demand headliners on the circuit, playing his trademark Epiphone ES 175 guitar at top festivals (Berks Jazz Fest, Capital Jazz Fest, Catalina Jazz Trax Festival, Seabreeze Jazz Festival, Rehoboth Beach Jazz Fest, Jazz Fest West, Punta Gorda Jazz Festival, Cancun Jazz Fest, Brian Culbertson’s Napa Valley Jazz Getaway), on theme cruises (Capital Jazz Cruise, The Smooth Jazz Cruise, Dave Koz Cruise,) and in other famed venues. Expanding his reach to Europe in recent years, Nick has performed several times at the Smooth Jazz Festival Augsburg in Germany, the Mallorca Smooth Jazz Festival in Spain and at in London, where he has headlined multi-nights for four consecutive years. Nick has received numerous honors throughout his multi-faceted career, including the prestigious 2007 International Instrumental Artist of the Year Award at the Wave Jazz Awards, where he succeeded 2006 winner Chris Botti. He was nominated for the award again in 2009. He was chosen Artist of the Year at the 2011 Rehoboth Beach Jazz Festival and Performer of the Year for Jazz Trax in 2010 and 2011. 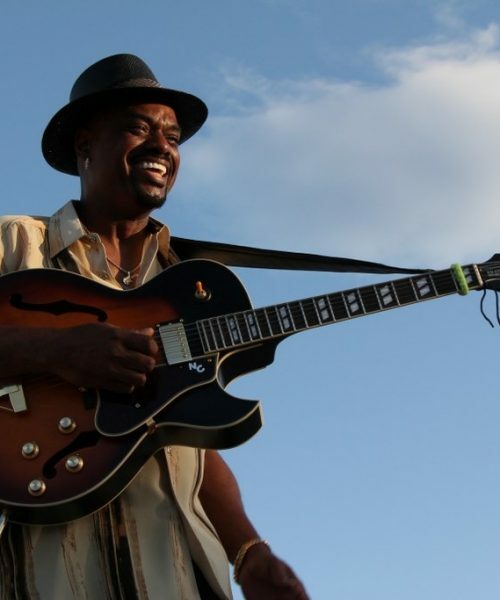 In 2010, Nick was nominated as Guitarist of the Year and Entertainer of the Year by the American Smooth Jazz Awards and received the Wayman Tisdale Humanitarian Award for his ongoing commitment to mentoring children and his work in the community and nationally in support of breast cancer causes. The recipient of the 1996 Malcom X College Alumnus of the Year Award (he earned his degree there in music), Colionne has devoted much of his spare time over the past 20 years to mentoring children at St. Laurence K-8 School in Elgin, Illinois. His roles include counseling, teaching music, computer music skills and guitar, and assisting with talent shows and holiday pageants. While most urban jazz fans started their decade and half love affair with the ultra-stylish (thanks to those hip Stacy Adams suits and hats) artist early in the 2000s, folks in “The Big Windy” were grooving to him years before via his early indie albums, starting with It’s My Turn in 1994. Perfectly in line with the sense of gratitude and reflection that drove The Journey and laid the foundation for Just Being Me, he wraps the new album with the cool, funky and atmospheric “Back Down Evergreen,” a revamp of a track that first appeared on that debut album. It’s a continuation of a theme he began on The Journey with “East Evergreen Revisited.” It’s Nick’s way of of paying tribute to Carol Ray, his longtime partner, manager and guiding force in his life who passed away in 2013. East Evergreen was the name of the street Carol lived on when Nick wrote it. Nick’s never been a huge fan of doing cover tunes, but Davis’ bluesy, jazzy, big band infused twist on the Motown classic “How Sweet It Is (To Be Loved By You)” made it an irresistible inclusion. The Big Dog-Nico chemistry also crackles on the first single, a classic, playfully rolling “drive time” tune with simmering old school key and flute textures; the slow simmering seduction “Spend The Night”; the tropically-tinged, sensually exotic “Latin Lover”; and the snappy and soaring, freewheeling jam “Nite Train.” Lloyd brings his lush, melodic keyboard touch and rich sense of atmosphere to the mood-setting late night ballad “Is This Love I’m Feeling”; the easy flowing romance “Still Connected,” featuring dynamic interaction between Nick’s guitar James’ keys; and the brassy, super funked-up “Go Nico Go,” whose title Nick takes as a command to let loose. Six of the tracks were mixed by saxophonist and producer Darren Rahn.